Morning - my turn to show you another amazing image from Dr Digi - Today its 3 Girls, 1 Mic. 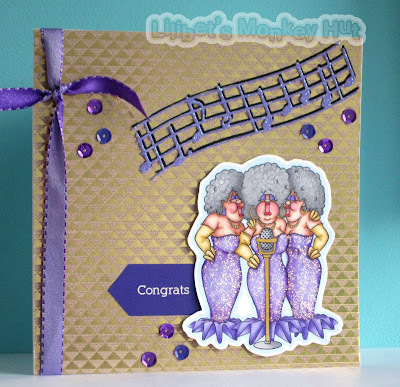 I had loads of fun adding all the glitter to these ladies as they had to shimmer and shine. I seem to have a bit of a thing for Purple at the mo but not sure why really. 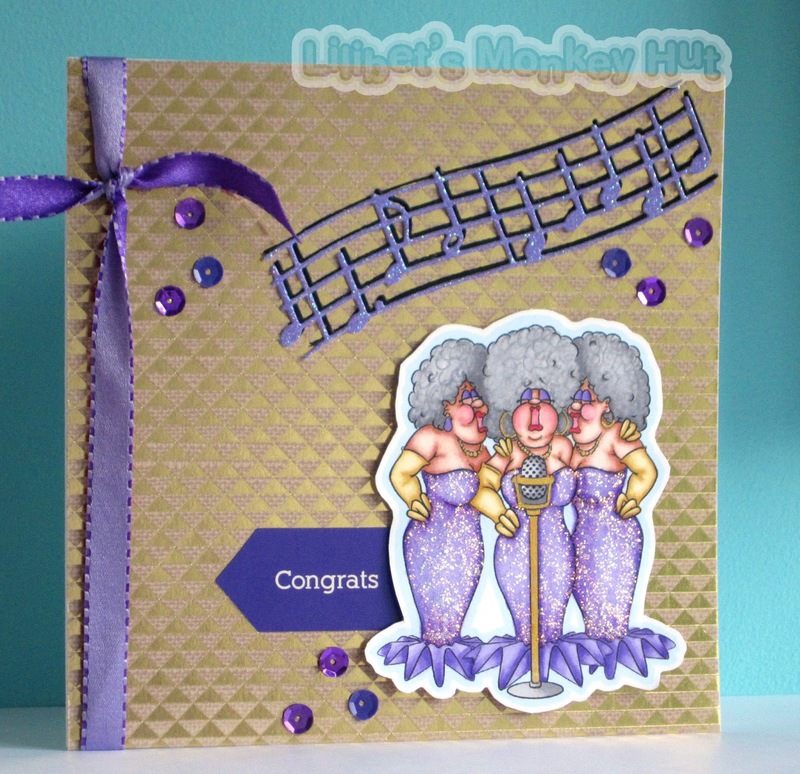 I think gold and purple go together well and is very opulent - which is only what these ladies deserve! 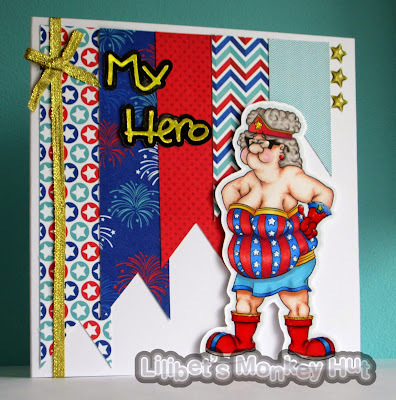 If you would like to see the full card recipe - pop by my blog here. All for now - love to hear your comments. 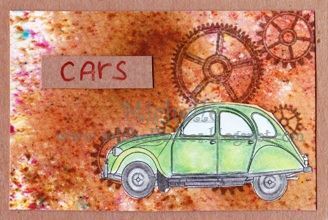 Today I made some ATC-cards. All of them with a car. 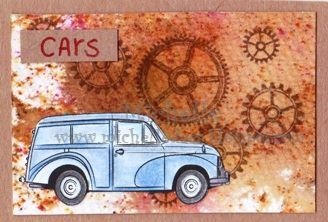 I used the Morris Mini Traveller, Citroen 2CV and Mini Cooper. I think it is nice to do this in such a small size. I thought these colours fit to the cars. 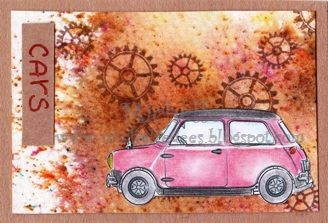 We have had a green 2CV and I see the Mini Cooper often in red. You find the cards HERE. Like to know how I did the cards read my blog HERE. 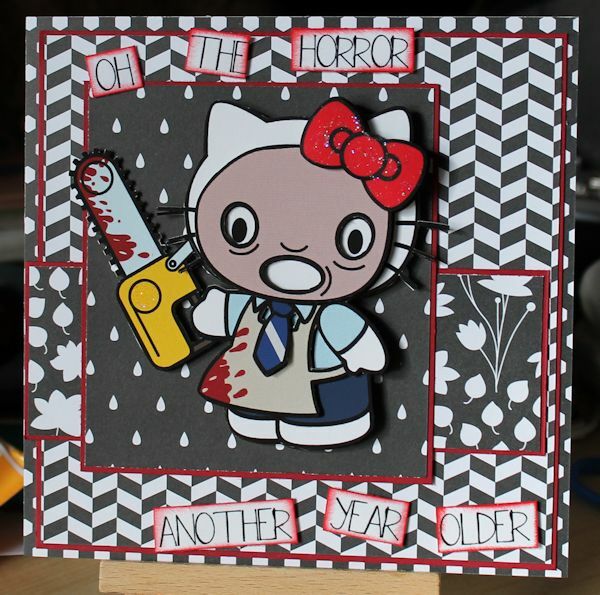 The first time I saw one of Dr Digi's Hello Horror collection, I was slightly taken aback, I am not a lover of the horror genre but then, despite being a cat lover, I am not a fan of a certain white kitty with a red bow in her fur. Merge the two together and they have a certain charm that I find very entertaining and not a little endearing; I have been racking my brain for a while now as to how to use them! 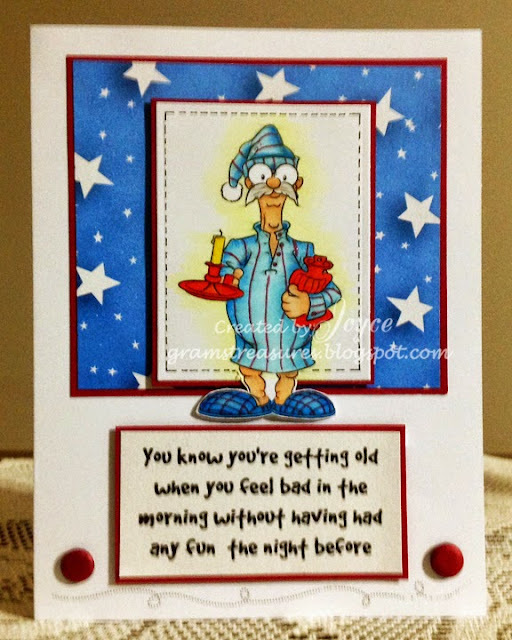 My 50th looms larger every day, 2017 can not come slowly enough for me, and this card describes how I felt on my recent 48th! You can find Hello Leatherface HERE, plus 5 others in the color digis section HERE, if you want all 6 you can get them with a £2 reduction. Hope you all have a good weekend, I am helping with a barbecue on Sunday at a dog show, just need to make sure none of the participants run away with the sausages! I made this card for a work colleague who leaves this week. Schrodinger is just great to use on a good luck card! All yours for £1 in the store! Daisy thinks she is taking the dog for a walk; our lovely lively dog has other ideas! Poor Daisy is left huffing and puffing in his wake. It makes me think of Bella Emburg in the Russ Abbott show that used to be on TV - am I showing my age?? To mention age - It was my Birthday yesterday - hence why this post is a little late as I didn't get chance to do it in advance. I was busy gossiping and catching up with my friends and eating and drinking with the family - What else do I need! If you would like the full card recipe - take a look at my blog. 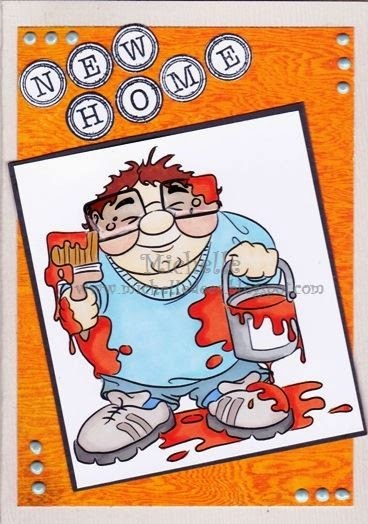 You may have thought this card would be for a guy, but no no no! In this case it is for the lady of the house. Hubby dearest is bringing her a cup of tea in bed, and who knows what other surprises may be in store. 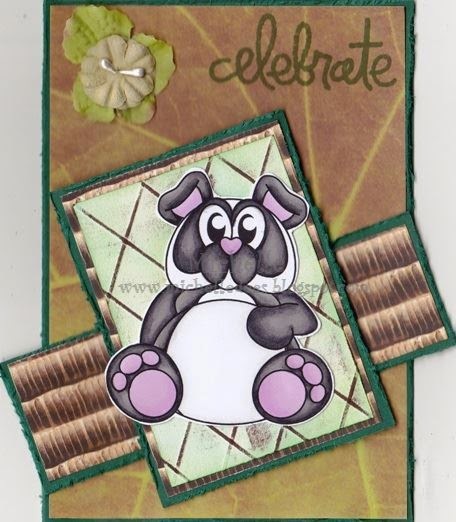 This fun image, titled Weekend Walter, can be found over at Dr Digi's House of Stamps. I even know who will be the lucky recipient ....my brother's wife. lol I'm sure she will get quite the chuckle. A few of us older UK residents may remember a 'wonderful' Sunday afternoon TV programme ( I think it was back when we had just the three channels, very deprived we were) featuring a certain lady called Barbara Woodhouse. A dog trainer, I don't know about dog trainer but she scared the living daylights out of me! The word 'Walkies' was drilled into my brain back then so much that when I hear the word I shudder. However Dr Digi has started to reverse that effect on me with this wonderful image featuring Daisy Bumblethorpe being walked by her dog. I am currently looking after my Mum and Dad's dog, he's getting on a bit now, but he still bounds in a geriatric fashion to the door when I come in, tongue lolling. 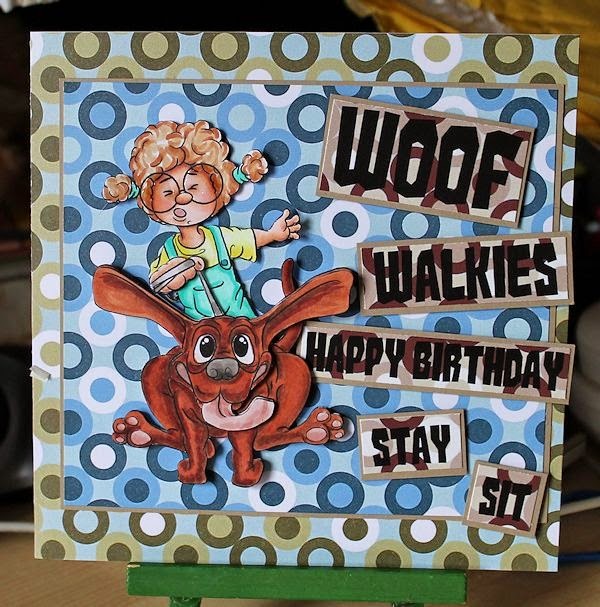 You can find Walkies HERE, and these fabulous backing papers called Polos HERE, the base layer of the card reminds me of my parents wallpaper back in the day when I was being scared by Barbara W! Hope you all have a good weekend, a bank holiday here. A well deserved award and a keepsake card to celebrate. I've used the trophy digi from the store however, I had a little accident with a sharp pair of scissors and ended up snipping one of the handles off. So the other one had to go through the same treatment. Fear not, the one in the store is fully intact! 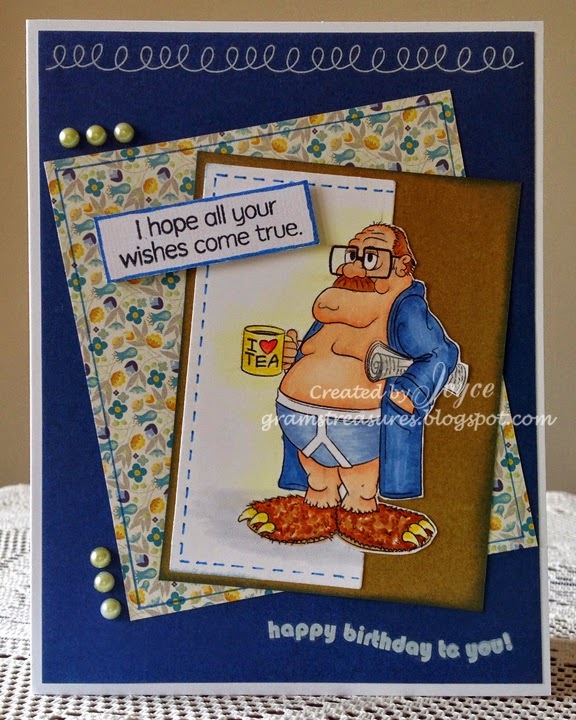 I am willing the Sun to come out by creating this card! I am ready for Summer & my veg plot is def ready for Summer - enough of the rain already! 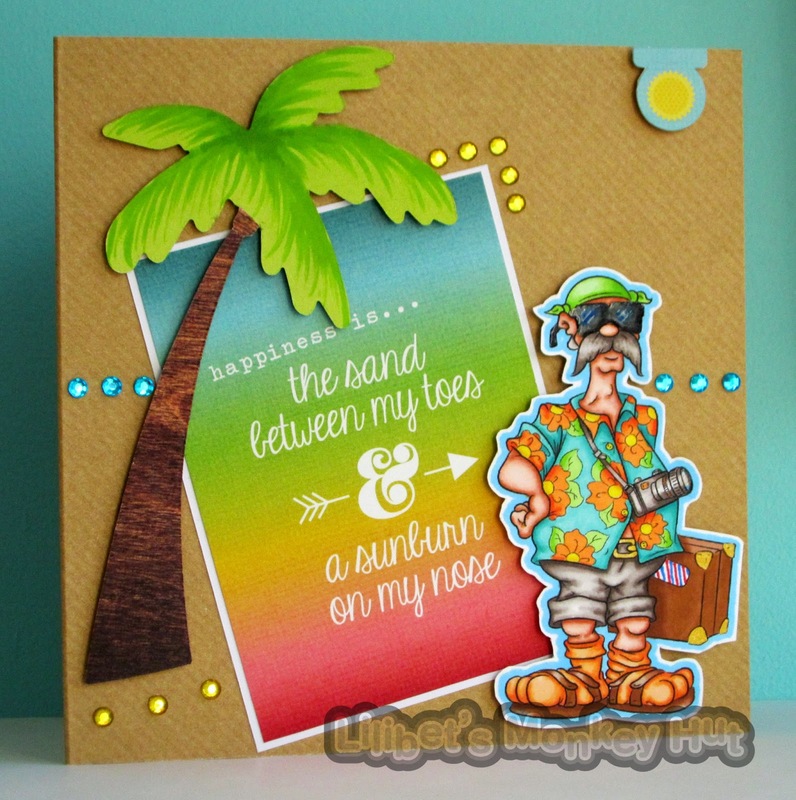 So I'll keep making bright and sunny cards in the hope that the weather warms up very soon. 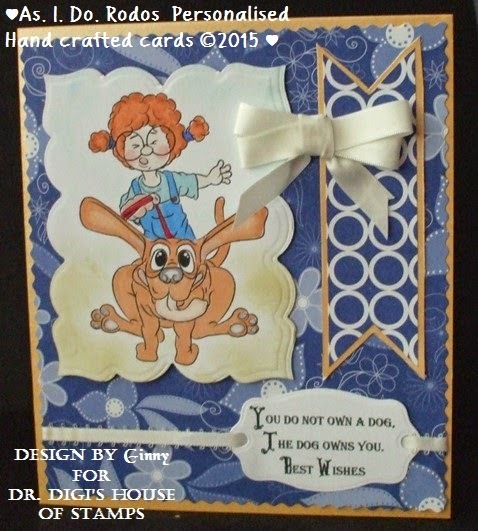 I made this card using Dr Digi image - A Dunderton Abroad. I want to go with his tropical shirt and suitcase somewhere exotic.Although my Passport is out of date and only sent for my renewal last week...! Maybe if we all keep our fingers crossed or do what ever the alternative is to a Rain Dance... we may just get lucky. 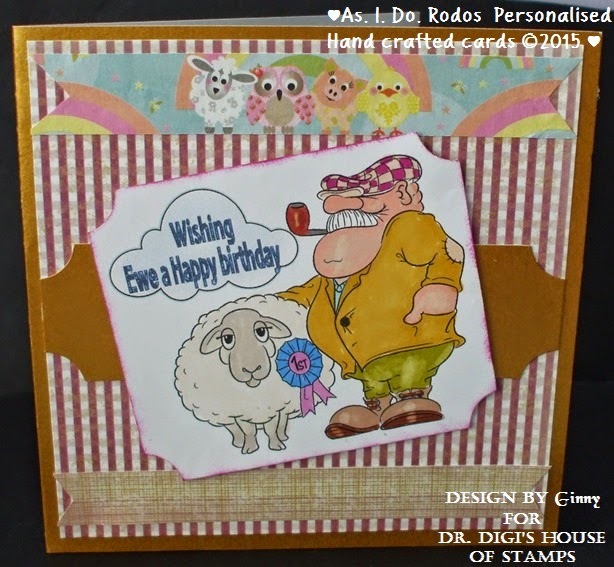 If you would like to see more of my wishful thinking and the recipe for this card - pop over to the blog. Did you ever moved in a new home. Most of the time you have to work a lot till you home is ready. So I thought maybe this guy can help. Unfortunaly he did not brought only colour on the wall. So I had to clean a lot more. You can find Non Drip Gloss HERE. Like to read about the card take a look HERE. 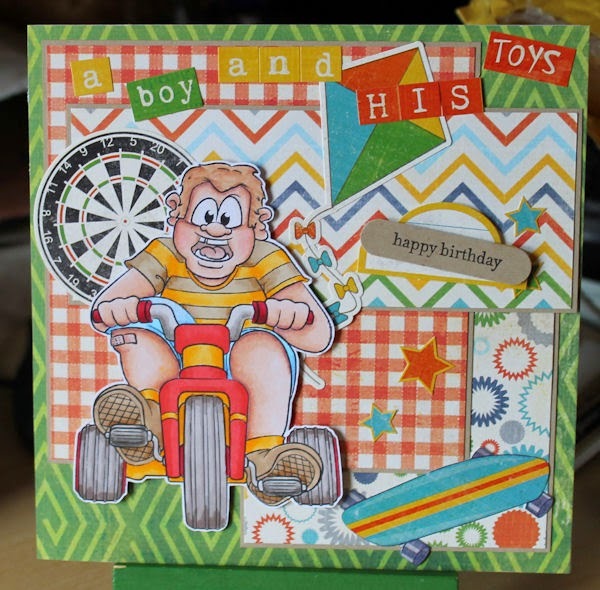 Summer's coming, time to get the bikes out, Barry Big Wheel here is all set with his trike, bright and shiny, ready to investigate out and about, well up and down the street anyway! Our street has lots of little cyclists, luckily the road is quiet so all they need is an adult to shout 'CAR!' now and again and they are free to roam. Paint Roller is in the Cheapies section - bargain! Another fantastic image to work with today it is called Light Lunch and he is having a whopping feast. His poor little workers are looking exhausted carrying that suckling pig and just look at all those dishes to be washed up!! Hello All - How cool is this digi image? He is called Rocky- his name will take you right to him over at the Dr Digi shop. I should have posted him last really if I had thought ahead a bit more. I made him for my Brother in Laws Birthday which was last Sunday - He does a bit of boxing you see. But Boxing was also all over the TV with the title fight over in America. I can't say that I even thought about staying up until 4.00am to watch it though! Isn't he a great image?! I love his facial expression! 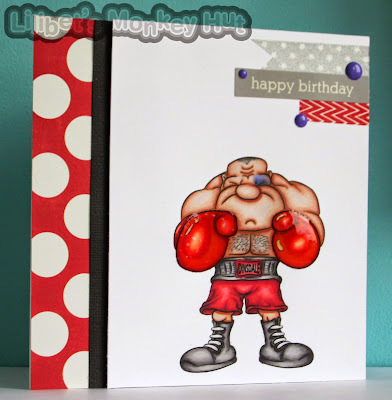 Any guy would be pleased as punch to get Rocky on a birthday card. You can find the full recipe for my card over at my blog - here. Good morning everyone. Are you feeling old today? I'm sure this sentiment was written especially for me, but I'm sure there are others who feel the same. 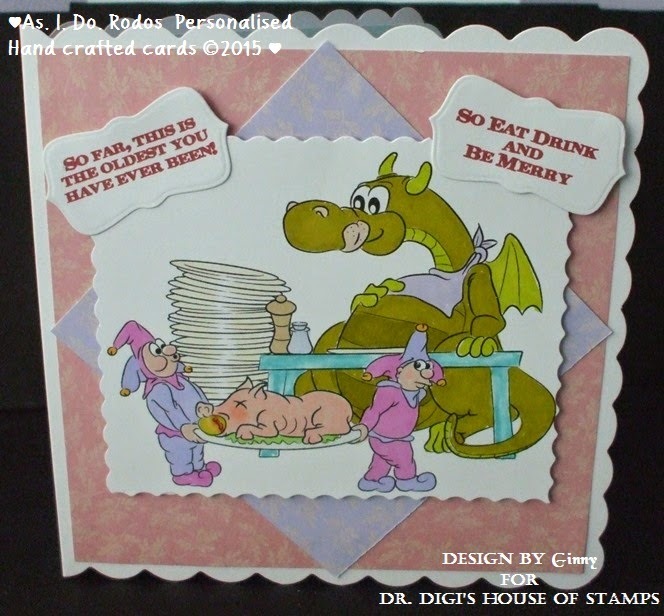 Today, my DT card for Dr Digi's House of Stamps uses both a saying and an image from the shop. With his candle, it looks like Derek is all set for the coming thunder storms and possible power outage. That hot water bottle is a left over from winter, but it still provides added comfort for the old bones. Flossy is always good to use for a farewell or a good luck card. Maybe its because I enjoy the play on words! Plus its one of my Dr Digi favourites! 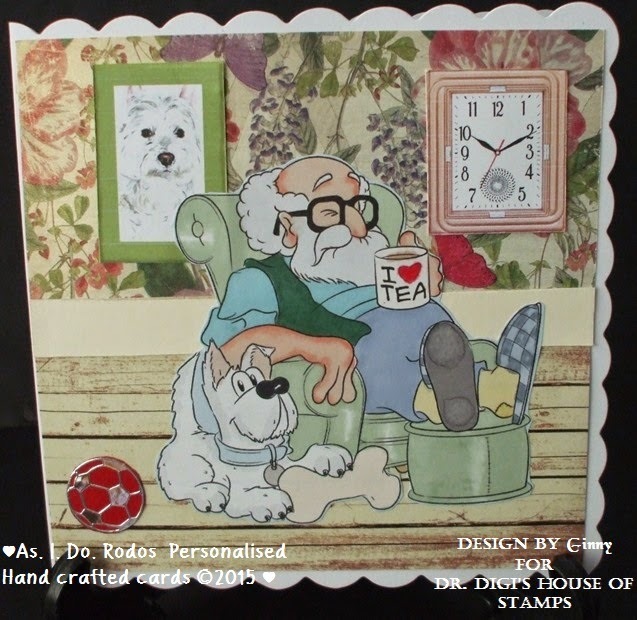 This is could be anyone’s granddad relaxing with his favourite mug of tea with little Trotsky by his side, his football team winning that’s what you would call a Perfect Sunday! Yippee - Its Bank Holiday weekend -That means I get an extra day off work! I made this for a Retirement card - Full card recipe can be found over at my blog. Just click HERE. Rain or Shine - I hope you have a lovely weekend. So I thought for my good mood and some relaxing I make this Panda. You find this panda HERE. And there are lots of more Cuddly Critters HERE. HERE can you read how I made this card. 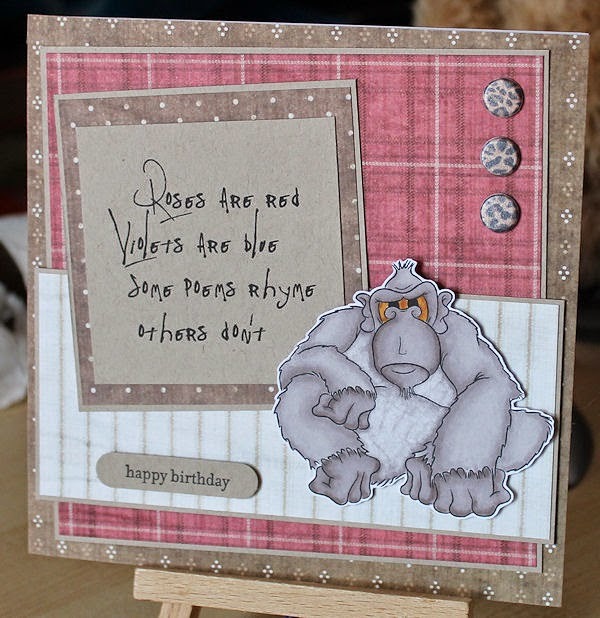 Well he shouldn't be grumpy because it's Friday and the weekend but we all have that curmudgeonly person in our lives! Grumpy Monkey is just in need of some bananas or even better some banana cake, then he'd be a happy monkey swinging through the trees! Maybe he will get that on his birthday! You can find Grumpy Monkey HERE, one of Dr D's £1 bargains, and the most excellent sentiment HERE, have a good weekend, eat as much banana cake or any other cake as you can!